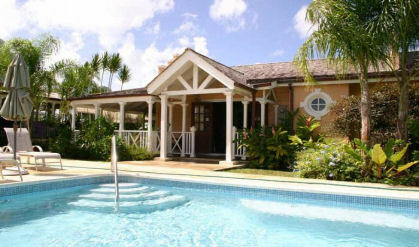 Bower Fold is a luxury, two bedroom two bathroom Barbados villa, situated on the ever popular exclusive West Coast. This Barbados villa enjoys a stunning position right in front of the pool on the exclusive private development of Porters Court, comprising eight traditional Bajan villas set in pretty tropical gardens. The magnificent West Coast beach is a mere three minutes walk and numerous restaurants, shops and hotel facilities are within a walk or short drive. There are several high standard local hotels within walking distance, such as Royal Pavilion and Glitter Bay immediately opposite Porters Court, offering fine dining and other facilities (some things at a charge), plus numerous other restaurants a short walk, drive or taxi ride away. Bower Fold is set in the lush tropical gardens of Porters Court and protected by electric security gates and intercom system for total privacy and relaxation. Housekeeping Service is provided twice weekly with additional housekeeping and/or chef available for a further charge.